Enjoy 100% cashback on GrabCycle. From 30 March to 30 April 2018, enjoy a 100% rebate on all GrabCycle purchases (minimum spend of $1) with our special introductory promotion! See below for terms and conditions. Get more than just instant access to a variety of brands and the flexibility to unlock more bikes, with just one app. 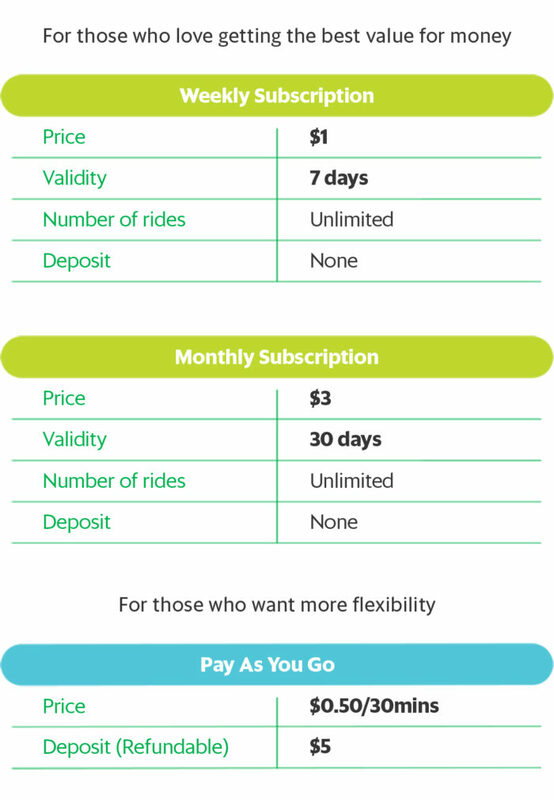 Subscription Plan ($1 for 7 days. No deposit): Each purchase will be credited back in its equivalent value ($1) into your GrabPay wallet within 7 working days. Monthly Plan ($3 for 30 days. No deposit): Each purchase will be credited back in its equivalent value into your GrabPay wallet within 7 working days. Pay As You Go ($0.50/30 mins): Up to a max. of $3 cashback based on total cumulative amount spent within promo period will be credited back into your GrabPay wallet by 7 May 2018. Cashback is only applicable for a minimum spend of $1, up to a maximum of $3 during the promo period. Cashback is only applicable for GrabPay Credits payments. “Enjoy 100% cashback on GrabCycle.” (“the Campaign”) is organised by Grab Pte Ltd. (“the Organiser”) and is open to all Grab users. The campaign will run from 30 Mar – 30 Apr 2018, Grab Pte Ltd reserves the sole and absolute right to alter or end the contest at any time, without giving prior notice or compensate in cash or in kind.